Nokia Lumia 610 - Gadgets Info. The Nokia Lumia 610 Windows phone introduces the convenience of live tiles on the homescreen that truly bring the phone to life and let you stay updated, every waking hour. The live tiles give you basic updates and allow you to navigate through it as if you were moving the screen window within that canvas. This simply means that you do not need to jump through different menus to get to where you want. Those special moments in life never pass you by, thanks to the 5 megapixel camera with 4x digital zoomand LED flash. You can take lively pictures and relive them in vivid colours on the phone. The camera is enabled with video recording capabilities and shoots video with 640 x 480 pixel resolution at 30 fps. The useful camera features like Geo-tagging, face detection, touch focus and continuous auto focus make photography on the Lumia very appealing. The Image Editor feature allows you to spruce up your photos before you share them with friends and family. 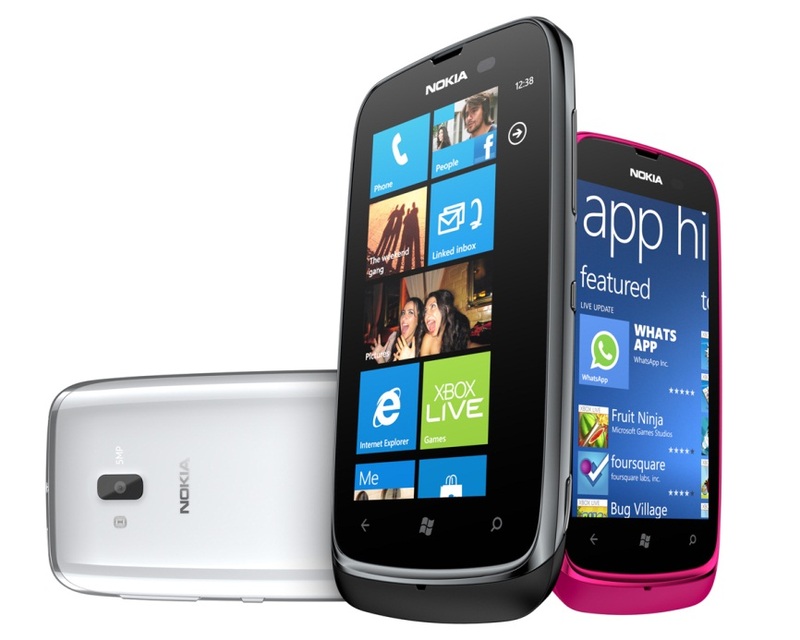 The GSM Lumia 610 mobile has been designed to bring connectivity to your fingertips. The Lumia 610 is enabled with GPRS, EDGE, 3G and Wi-Fi, allowing you to stay connected, no matter where you are. The phone offers tethering facilities using the Wi-fi Hotspot feature that allows the Lumia 610 to connect to the mobile network and act as an independent Wi-Fi router. You can create your own Wi-fi hub and wirelessly share the phone’s internet with other devices like your laptop. The Bluetooth feature allows you to share data and images with other compatible devices. The GPS enabled Lumia 610 is equipped with A-GPS with Nokia Maps and Bing Maps making navigation a piece of cake. When it comes to your business related activities, the micro SIM Lumia 610 helps you with useful features like document viewer, pushmail and email. The Lumia 610 comes with useful features like Facebook, Twitter, LinkedIn, Nokia Email, Gmail, Yahoo Mail, Windows Live, Hotmail, Instant Messaging, Flickr, Picasa, Twitter and YouTube, allowing you to stay connected, updated and entertained. The multimedia features of the phone are also worth mention. The phone has a music player that supports MP3, WAV and eAAC+ formats and the FM radio allows you to stay tuned to your favorite stations. The video player supports 3GPP, MPEG-4, H.263, H.264, WMV 9 and ASF video formats. The MMS enabled Lumia 610 also comes with useful features like calendar, to-do list, flight mode, active noise cancellation, Microsoft Zune and voice input to help make your day-to-day activities easier and organized. The Nokia Lumia 610 is a multi-tasker’s phone and uses innovative means to help you stay connected, get work done and be entertained, giving technology-bitten users everything they are looking for.